HealthCost provides private pay consumers with cost and quality information for common healthcare services. 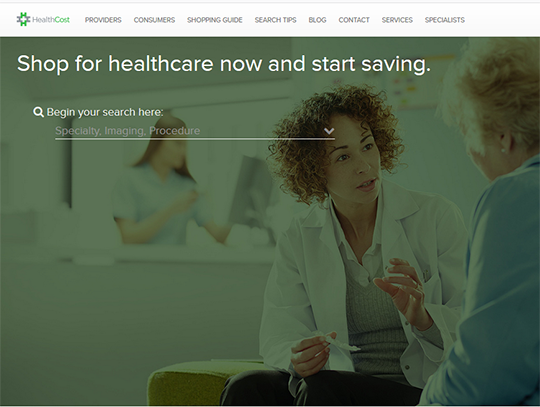 Consumers can search by medical procedure or provider within a particular search area. Patient experience data for providers is also available. Cost information includes provider charges and HealthCost Networks rates. Charges refer to the amount your provider establishes and subsequently submits on their bill to government and private health payer organizations for a medical service. HealthCost NetworksSM Rates are the private pay rate HealthCost providers are willing to accept from a consumer for medical services. If the provider is part of the HealthCost network, the user will be contacted to set up an appointment at the agreed upon cost. If the preferred provider has not joined HealthCost yet, they provide the ability to send the provider a message to request a rate.